Welcome to my Team In Training home page. 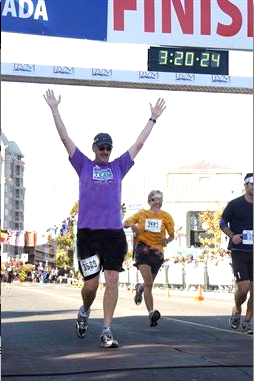 I'm fundraising for the 2014 Chicago Marathon on October 12, training with my friends at The Leukemia & Lymphoma Society's Team In Training. Please make a donation in support of my efforts with Team In Training and help advance the research for cures. This will be my fifteenth season with TNT (previously a half marathon in San Francisco and fulls in Portland, San Francisco, Napa, Victoria BC, Atlanta, Washington DC, Los Angeles, Chattanooga, Oakland, Richmond, San Luis Obispo [twice], and New York City) and I welcome anyone who would like to make a repeat donation to a great cause! "Hal, have a terrific run tomorrow, I am proud of you!"